One of the results of the Kate/KDevelop sprint in Vienna is the new “MiniMap” that can be used instead of the vertical scrollbar. I came to the sprint with a black and white version of it for the symbols viewer, but got encouraged to integrate it to the core. The result, in cooperation with Sven Brauch from KDevelop, is a nice Mini-Map that can be enabled both in Kate and KDevelop. Nice work! This reminds me a bit of Sublime Text, they’ve implemented that feature is a really nice way. 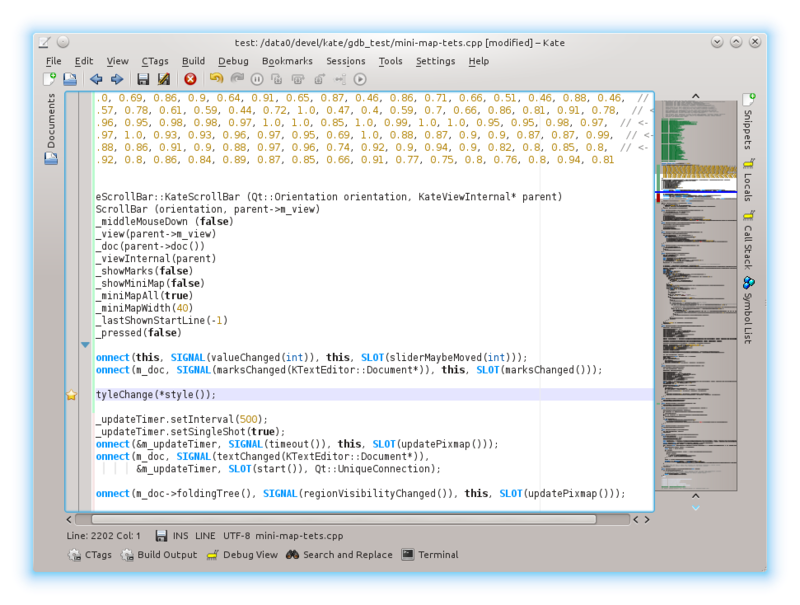 The text color and the background follow the kate color scheme while the “shielding” is from the KDE color sheme. Please don’t hide this great feature behind a settings checkbox where only few people will find it! Switch it on by default with a button on it to hide it. Most people will like it and if those who don’t have an easy way to hide it, it’s fine. But having to go to the settings and clicking a checkbox (with a label that doesn’t even make clear what it does) will unneccessarily limit its impact. Sorry, on per default is a no-go. Many apps use inline KatePart’s and won’t want to have this in the way. Actually if you use splitters a lot, the mini-map is too big to be usable ;) Still I like the feature. Okay, thats’ understandable. Would it be possible to have it on per default in Kate itself but off in KatePart? People using vertical splitters could still switch it off. Or maybe it could be switched off automatically if vertical splitters are used. Anyway you’re likely to need an easy way to switch because people may want it in one moment but not anymore in the next and don’t to go through the settings dialog each time. Settings is not meant for stuff you change often. Excellent. This was one of the things that was going to make me investigate editors other than kate. Awesome! Reminds me of SeeSoft and work that extended it. You might have a look at: http://www.cs.rug.nl/~alext/PAPERS/InfoVis05/paper.pdf for inspiration on further improvements (well perhaps that’s a matter of taste). I have moved on from Kate to VIM about a year ago, but this feature might just pull me back. Thanks, the minimap looks terrific! Alright. This is divine. The most awesome text-editor and IDEs just got a lot more awesome. Please tell me this is gonna be in 4.10. Me: uh, that scroll-preview-thingy is cool. Which text editor are you using? Coworker: Sublime! It’s really cool, check it out! I’ve been looking for a such plugin, and it’s actually available just in the settings, very nice.